Can’t decide what color Lexus to get? With the company’s one-of-a-kind LIT IS sedan, you can choose a different color, design, and even animation every morning as you head off to work. 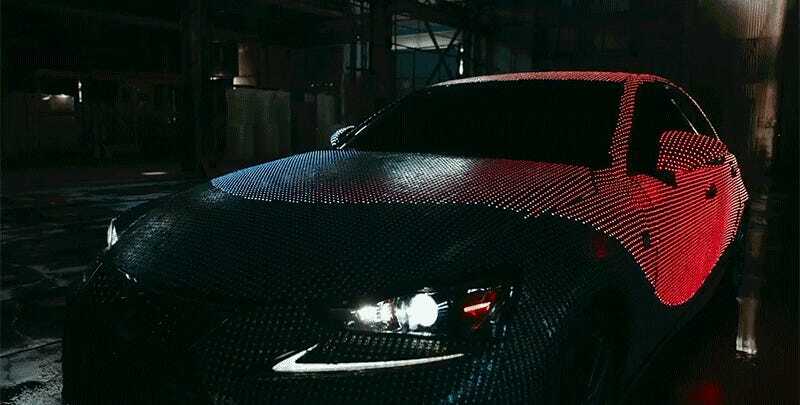 Instead of paint, the vehicle is covered in 41,999 programmable LEDs turning it into a giant, rolling display. Created in collaboration with Vevo, the vehicle appears in the new music video for Dua Lipa’s Be The One, but isn’t just a special effect realized in post-production. The flashy car really exists, and in addition to an interactive mode that allows someone outside the vehicle to change its design and animations using hand movements, it also responds to music, turning those thousands of LEDs into a visualizer that’s synced to whatever song is playing on the car’s stereo. That probably won’t be too distracting to other drivers, right? Don’t hold your breath that Lexus might make this an official option for its vehicles, though. The LIT IS required 5,280 feet of wire just to connect all those LEDs together. And you can imagine what kind of damage a random rock hitting the vehicle would cause while it was cruising down the highway.